Searching for a complete set of graphical user interface / GUI to finish your Pixel Game? This is the perfect GUI kit for you! Contains everything you need – buttons, ui components & more! The pack includes more than 70 elements you will need to begin with your pixel game project. The asset is made with high quality detailed assets. All elements are available for normal size and x3 size. 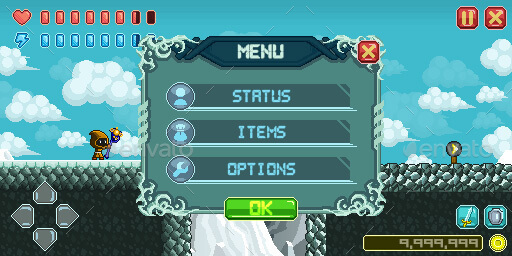 A collection of various game UI for creating a 2D game interface. Suitable for in-game menu, main menu, shop etc. 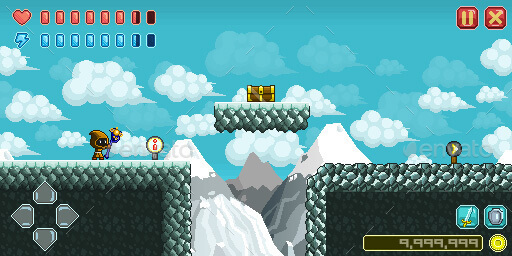 Use this mario pixel art style design ui for creating a 2D platformer side-scroller game. Develop games with adventure, fantasy, action, real time strategy, combat and other similar theme. You are only allowed to release ONE game per License. The Standard License means your game should be Free but it can contain IAP – In App Purchases and the Extended License is if you intend to charge people for the game from the start. You can of course publish the game on ANY number of platforms, like Steam, iOS – Iphone, Ipad, MAC App Store, Android mobile phones, android tablets, Amazon, Steam, PC, Windows, Xbox, Playstation, Nintendo and more. These 2D pixel art game ui pack contains ALL pixel graphics you need to complete your own pixel game. The most important buttons for every game. You can easily add any buttons you want using the blank button. Upgrade the players experience with directional buttons in your game! A game couldn’t be completed without a cash container for a player to get level up! We put our hearts and souls into everything we design. We are a team of 4, working in a small game design studio focusing on creating the best, top rated game art design. You can visit our exclusive Portfolio to see some of the amazing game design and browse the game kits available. 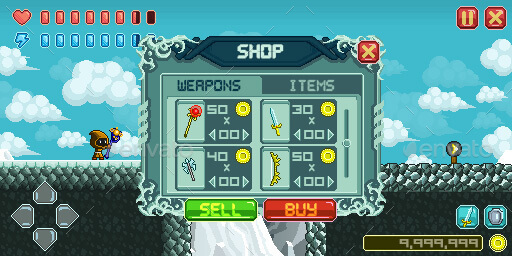 We design all 2d graphical game assets you need in a game, from animated game characters, parallaxed game backgrounds, buildings, custom game animation, gui or ui, weapons, animated nature props like trees, bushes, flowers, tiles or tile sets, level design objects you can use for that extra WOW feeling for the best experience to your game. Follow us and stay updated with our brand new releases. We have some amazing artwork / game designs in progress. Pixel Art 2D Platformer Video Game Kit Assets are one of the best game assets pack on GraphicRiver and can give you a great residual income. How? simply refer people through your website or social media pages to this game kit or to our other game asset pack here. Make sure to sign up as an affiliate so you can add your referral code to any link you publish or post. You can always share to us what you’ve created with our game assets to give inspiration to all game developers out there! If you purchase this game asset and need assistances – feel free to contact us with any questions!